Second-youngest U.S. team also includes Kenin, Pegula and Brady. The United States finds itself in the unfamiliar position of needing to win its Fed Cup by BNP Paribas World Group playoff tie next week against Switzerland in order to remain in the group of eight World Group nations that will compete for next year’s Fed Cup trophy. The 18-time Fed Cup champions were eliminated by Australia 3-2 in Asheville, N.C., in February. Now, the U.S. has brought back some of its best players not named Williams (as in Serena and Venus), in World No. 8 Sloane Stephens and No. 14 Madison Keys, to fortify its lineup. The Americans will face a Swiss team that will be minus World No. 20 Belinda Bencic. When the U.S. and Switzerland meet on an indoor hard-court surface at Freeman Coliseum in San Antonio, Texas, April 20-21, it will be the ninth time the two nations have faced each another. The Americans own an 8-0 win-loss record, including five wins on clay. The most recent tie between the two nations was in 1993, won by the U.S. in Frankfurt, Germany. The U.S. won the Fed Cup as recently as 2017 while Switzerland’s 1998 runner-up finish is its best result. On Wednesday, U.S. captain Kathy Rinaldi named Stephens and Keys to the American Fed Cup team as well as No. 36 Sofia Kenin, No. 76 Jessica Pegula and No. 78 Jennifer Brady, who is also ranked 49th in doubles. Meanwhile, Swiss captain Heinz Guenthardt nominated No. 81 Victoria Golubic, No. 112 Timea Bacsinzsky, No. 144 Conny Perrin and No. 183 Ylena In-Albon. In Stephens and Keys, the Americans have a formidable 1-2 punch and will be at an advantage not only playing in front of a mostly pro-American crowd, but also because Switzerland will be competing without Bencic, its top-ranked player. With an average age of 23, this American team is the second-youngest of the eight that Rinaldi has captained. “Obviously, Sloane, Madison and Sonya (Sofia Kenin) are three of our brightest young American players at the moment,” Rinaldi said. “Very excited to have them representing the red, white and blue, and Sloane and Madi, they’re great friends. Stephens, 26, who won the 2017 U.S. Open title and was a finalist at last year’s French Open, has been ranked as high as No. 3. 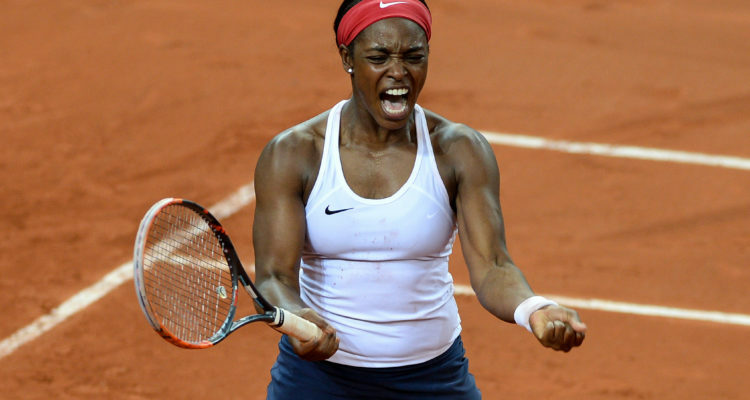 In her last Fed Cup competition, the aforementioned 2018 semifinals against France, Stephens contributed two points by winning both of her singles rubbers. The 24-year-old Keys will be appearing in her sixth Fed Cup tie for the Americans. On Sunday, she won the Volvo Car Open in Charleston, S.C., on green clay. Also, Kenin, who is the third-youngest player in the WTA Top 40 at age 20, made her Fed Cup debut in the 2018 final in Prague, losing twice to the Czech Republic – including a three hour and 45 minute decider against Katerina Siniakova. Meanwhile, Pegula, 25, and Brady, 23, are making their Fed Cup debuts. • The U.S.-Switzerland Fed Cup tie will commence on Saturday, April 20 at 2:30 p.m. local time (3:30 p.m. Eastern Time, 8:30 p.m. London, 9:30 p.m. Central Europe), and on Sunday, April 21 at 2 p.m. local time. Tennis Channel will present live daily coverage nationally in the United States. Tickets to both Saturday and Sunday sessions are available via Ticketmaster.com. • At stake, the winner of the U.S.-Switzerland tie will return to the top-level World Group of eight nations and be eligible to compete for the 2020 Fed Cup title. The loser will be relegated to World Group II next year. This entry was posted in Davis Cup / Fed Cup, Fed Cup and tagged Fed Cup, Sloane Stephens, United States.